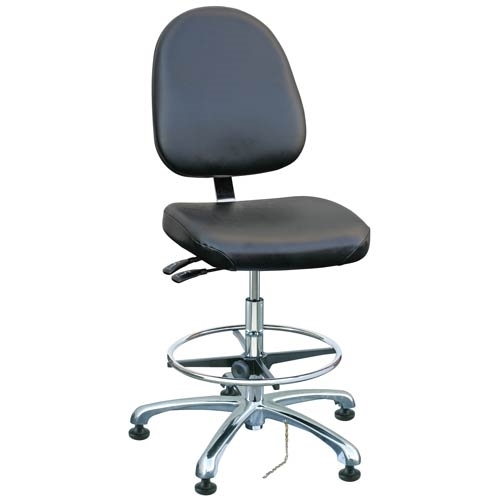 The Bevco 9551LE1-BK Integra- ECR 9000 Series Class 10ESD Cleanroom Chair is a 300lb. capacity chair that is provided with ESD- safe mushroom glides. This ESD/cleanroom chair allows the height to be adjusted by the Pneumatic control and can swivel a full 360 degrees. The 9050LE1-BK 9000 ECR series also features an adjustable backrest with lumbar support and has a static resistance of 10^5 to 10^9 ohms. This ESD chair complies with ANSI/BIFMA and California 117 Standards. Please note the L represents the large size back.